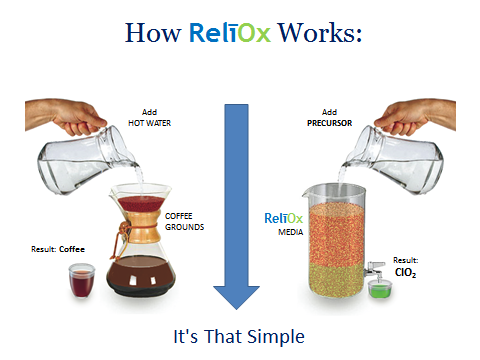 RelīOx provides “custom tailored chlorine dioxide”: Just the way you want it every time. ClO2 is one of the oldest known chemical compounds. It was discovered during the Napoleonic Wars. No practical method of making it was developed until early in the 20th Century. At this time other chemicals were created that made large scale Chlorine Dioxide generation practical. By either pumping Chlorine gas through one of these new chemicals or by mixing one of these chemicals with a strong acid (sulfuric, hydrochloric, etc. ), Chlorine Dioxide could be produced. Notice the confusing similarity of the names of the two chemicals mentioned above. It is important to an understanding of Chlorine Dioxide to recognize that there is no relationship between the two chemicals any more than there is between Carbon (a solid material) and Carbon Dioxide (a gas). For RelīOx’ purpose we will be discussing only the properties of Chlorine Dioxide that apply to advanced chemical research and the remediation of extreme odors from the human environment. RelīOx products deliver CIO2 conveniently, immediately & safely, at neutral pH, in precise amounts, wherever & whenever needed! THE RelīOx ADVANTAGE: Unlike other CIO2 products, no dangerous chemicals are used in production of RelīOx ClO2. The single dangerous chemical use is consumed in the Company’s factory, with no environmental harm. RelīOx creates no persistent or destructive by-products! Why Does Chlorine Dioxide Production Matter? Chlorine Dioxide or ClO2 is the best liquid product for extreme odor control available. RelīOx overcomes all past problems with producing ClO2 and does a better job of eliminating the strongest odors while presenting little harm to your personnel, equipment or facilities. A specifically formulated dilute (not dangerous) feed chemical. When ClO2 is desired, the feed chemical is passed through the cartridge, resulting in a stream of pH neutral Chlorine Dioxide that has been pre-set to the exact user desired concentration. ClO2 can be produced as desired, in batches, in a stop/start mode or in a continuous flow. In terms of scalability, the RelīOx Process can generate quantities from 5mL to 100s of liters. RelīOx capacitor media can be recharged multiple times using a third proprietary chemical named ReNeu. Making the process long term sustainable as well as being environmentally friendly. All of our chemicals have long term storage stability. Concentration is important. Industrial uses of ClO2 can reach 5 to 15,000 parts per million (ppm) of ClO2 dissolved in water. While this is economical for a municipal water treatment process or a pulp bleaching operation, where millions of gallons of water are being treated, concentrations that high are highly dangerous to people. In the area of Odor control, it has been found that much, much lower concentrations are still extremely effective. Concentrations or strengths below 100ppm are usually adequate to destroy odors. RelīOx products can be provided in a variety of concentrations, with few odors requiring even 300-500ppm for destruction. RelīOx ClO2 generators are based on a proprietary, safe chemical generation process. The heart of RelīOx technology is a stable, dry, bead-like media, with a capacity to oxidize a precursor liquid chemical to produce pH neutral Chlorine Dioxide with NO dangerous chemicals in the process and NO waiting. RelīOx produces ready­-to-use Chlorine Dioxide, whenever – and wherever – needed! RelīOx is designed with user safety and the safety of the environment in mind. We will be registering all products under accepted standards for “green” labeling.